Farmer's Pride Organic Blend Micro is a micro-nutrient formulation that provides plants with all the required micro-nutrients in the correct ratios. The micronutrients in this product are amino acid chelated. Amino acid chelated micronutrients are a great alternative to synthetic chelates such as EDTA. Amino acid chelates are recognized by plants as natural building blocks of plant tissue and are easily translocated within plants to where they are needed. Once inside the plant the micro-nutrient is released and the remaining amino acids that formed the protective shell are used by the plant as a source of water soluble nitrogen. This product also contains extremely high quality magnesium and sulfur derived from Epsom salts imported from Germany. 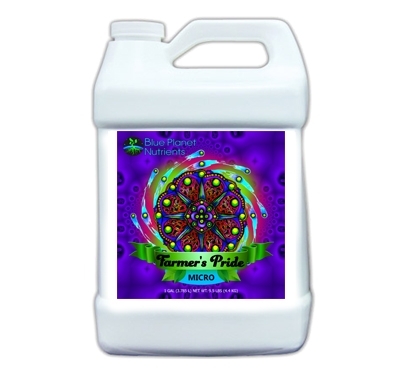 Farmer's Pride Micro is very safe for all plants in either soil or hydroponic culture. Use this product in conjunction with Farmer's Pride Grow and Bloom or as a stand alone to correct micro-nutrient deficiencies. This product can be applied as a foliar spray. Use 1/5 the recommended application rate for foliar application.